I wrote yesterday about a handful of strange legal developments in Canada. In a display of balance, however, I noted in my conclusion that Canada in recent decades has been “very sensible” with regard to economic issues (spending restraint, welfare reform, corporate tax reform, bank bailouts, regulatory budgeting, the tax treatment of saving, school choice, and privatization of air traffic control). But “very sensible” is not the same as “totally sensible,” especially not if you count recent years. The nation’s current top politician, Justin Trudeau (a.k.a., Prime Minister Zoolander), increased the top tax rate from 29 percent to 33 percent after taking office in late 2015. It appears, though, that he wasn’t aware of a concept known as the Laffer Curve (or, like some folks on the left, maybe he simply didn’t care). In the real world, however, it turns out that increasing tax rates is not the same as increasing tax revenue. It’s quite possible, as noted in the article, that some of the foregone revenue might be the result of one-time changes, such as upper-income taxpayers shifting income from 2016 to 2015 (rich people do have considerable control over the timing, level, and composition of their income). A report from Global News reviews a report about the degree to which revenues dropped for transitory reasons. Much of the data in this story came from an analysis by the C.D. Howe Institute. Here’s the key chart from that study, which disentangles the one-off changes and permanent changes caused by the higher tax rate. 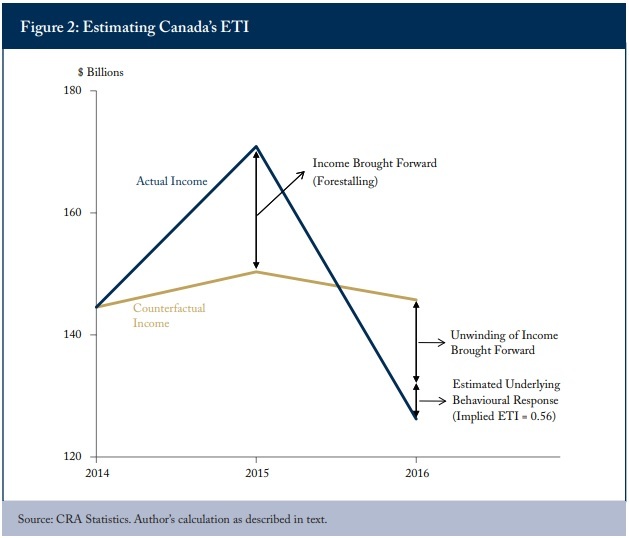 The revenue will be less than projected by static revenue estimates because of permanently lower levels of taxable income. The added revenue for the central government is more than offset by lower tax receipts for subnational levels of government. In other words, Trudeau’s tax hike was a big mistake. The only tangible results are that the private sector is now smaller and the country is less competitive. For what it’s worth, I view the lack of additional tax revenue as a silver lining to an otherwise dark cloud. Maybe, just maybe, this will put a damper on some of Trudeau’s irresponsible plans for more spending. P.S. For those interested in Canadian fiscal policy, I shared some research last year about the implications of provincial changes in tax policy. Daniel J. Mitchell is a top expert on tax reform and supply-side tax policy and is Chairman of the Center for Freedom and Prosperity. Mitchell is a strong advocate of a flat tax and international tax competition.